Ever since we were kids, we were taught about the value of money. And as soon as we developed the need to buy the latest toy, clothes, mobile phones, etc. we began to understand it as well. However, while money can buy a ton of things, it has certain limitations as well. And one of those limitations include humility. Cricketing legend Rahul Dravid has showcased it by standing in a queue during his kid’s science exhibition. And so has Bill Gates. According to Bill Gates’ Wikipedia page, his net worth is $95.6 billion, as of November 2018. But let me know if you can see a hint of arrogance that usually comes with that amount of money and fame in his latest public appearance. In case you’re wondering who is the “wannabe poser in the White House” Galos is talking about, it’s Donald Trump and his lavish party. Netizens loved Bill Gates for standing among the common people, despite not having the need to do so. Here are some of the reactions. The usual reaction to a billionaire like Bill Gates doing something common, is “Why should it be lauded? We do it everyday”. 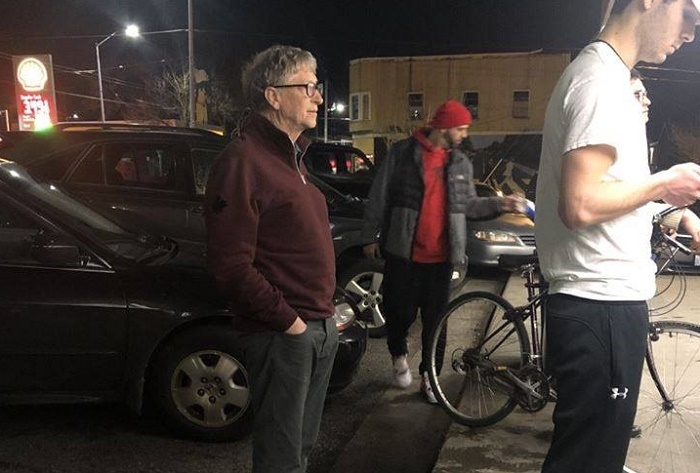 However, in my opinion, it’s better to highlight Gates standing in a queue than Trump boasting about food because it sends a better message to the upcoming generation. And that is, no matter how big you become, be humble.